Macdonald Spey Valley Championship Resort is rated 4.5 out of 5 based on 2 verified reviews from YGT customers. Renowned golf course architect Dave Thomas was commissioned to build in one of the most picturesque locations on offer in Scotland. 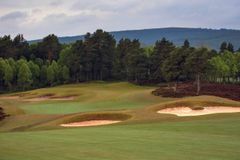 To match his brief, he has created Spey Valley, a golf course that is challenging, particularly at 7,153 yards from the medal tees, but is not so difficult that the average golfer cannot enjoy the stunning scenery. 1 in 12 goes free in 2018 & 2019! Opened in July 2006, Spey Valley will mature further still, and is being tipped for recognition among the top Scottish courses. The signature hole will undoubtedly be the par-5 fifth hole; measuring 641 yards, it is unlikely that even the longest out there will be having a go at the green. It is reasonable to view Spey Valley as a hidden Scottish Gem, but it seems unlikely that it will remain that way. As you would expect from Dave Thomas, this is a ‘proper' golf course, and accompanied by the vivid purple heather and towering peaks of the Cairngorms National Park, it becomes a truly awesome place. At the Aviemore Resort, there are two excellent hotels to choose from; accommodation is available in either the 4* Macdonald Highlands Hotel or the 3* Macdonald Four Seasons Hotel, both of which are firm YGT favourites. The Macdonald Highland Hotel offers its patrons the customs and service of a top Scottish venue, and has been tastefully designed and furnished in a contemporary, stylish fashion. Guests are guaranteed the best in comfort and convenience as a base to experience all that Aviemore resort and its surroundings have to offer. With all that is on offer in Aviemore, a reliable and comfortable base is crucial to recover from the exertion of all the activities, and the Macdonald Aviemore Highland Resort provides just that. Aviemore can leave you feeling a bit worn out, so take advantage of the Vital Beauty Spa, which offers a full range of wellness and beauty treatments for both men and women. From hot stone therapy to special bridal packages, allow the specially trained staff at the spa to pamper properly. For the more active, there is a state-of-the-art gym, with the latest in fitness technology, and an excellent swimming pool. Famous for its outdoor activities including golf, watersports, and winter sports. Eat at the Ptarmigan Restaurant, located just below the summit of Cairn Gorm. Ascend on the Cairngorm Funicular, Scotland's highest mountain railway. Dine in ‘Aspects', the sophisticated signature restaurant for the best in local cuisine, and then enjoy a night-cap in The Laggan, whisky and cocktail bar. With 100 single malts on offer, including over 60 from the Speyside area, even the connoisseur will be spoiled for choice. Spey Valley is a magnificent golf course, with fantastic scenery and a test for all golfers. The new clubhouse is only 6 months old is small compared to other courses but the facilities within the are fantastic. The Aviemore Highlands Hotel was great too, with the guestroom and meal both very good. Really good value for money. Overall I would give the trip 8/10. I would have given it 9 but it rained all day Monday! I would certainly recommend YourGolfTravel to friends. The hotel at Spey Valley was plush and very comfortable. The rooms were first class and in a great place, just behind the centre of the town. There are few superlatives that come close as the area is surrounded by the most spectacular scenery. The course itself was in fabulous condition, the fairways like carpet and the greens like snooker beize! The course is laid out very well too and the carefully positioned bunkers make for a challenging round. All in all this was a great value golf break. The golf course is worth the money we paid on its own but coupled with the great hotel, it was the best one nighter golf package I've ever been on.